The artistic language that Ben Aronson and Phillip Maisel speak in their respective works is one grounded in the truth and another in an alternative reality that requires a visual leap of faith. For Aronson’s paintings, that leap is toward an expanse of light and shadow, where the urban landscape — buildings, hills, skylines, and the like — produces a feeling nearly of divine mystery. For Maisel’s art, that leap is toward a provocative three-dimensionality — a place where abutting, overlapping materials borrow from collage, sculpture, and abstraction to produce something altogether bigger than the sum of its parts. Collectively, their art is bewitching, and beautiful. But it’s the substance behind the work — which you can discern when seeing it up close — that elevates their art into higher states of being. Aronson’s paintings are now on view at Jenkins Johnson Gallery, in a group exhibit titled “Summertime…”, while Maisel is perched in his own show, “As It Lays,” at Gregory Lind Gallery. For Aronson, his participation in “Summertime…” lets him display new paintings of San Francisco that idealize swooping vistas of a city Aronson identifies with painters Richard Diebenkorn and Wayne Thiebaud. There’s a reason that painters like Thiebaud — along with filmmakers like Alfred Hitchcock and Peter Yates (who made 1968’s Bullitt, starring Steve McQueen) — have been drawn to San Francisco’s elevated streets. Thiebaud has painted them with a verticality that makes San Francisco seem like it’s on stilts. Yates had McQueen racing his Ford Mustang along the byways of North Beach and other neighborhoods, putting the car (and viewers) almost in the clouds. Aronson does the same thing in his new painting Toward Potrero, which takes a bird’s-eye view of the hilly contours that extend up the hill of that name. The outlines are all there: of streets, buildings, trees, and the neighborhoods in the distance, but it’s not quite a literal representation of the city. Rather, it’s a dreamy interpretation that, like his other new San Francisco paintings — Sunlit Buildings,Telegraph Hill, and Down Broadway to the Bay Bridge — plays with the light and shadows that dance across the city’s environs. Aronson, who lives outside of Boston, says it was art that first attracted him to San Francisco. Indeed. 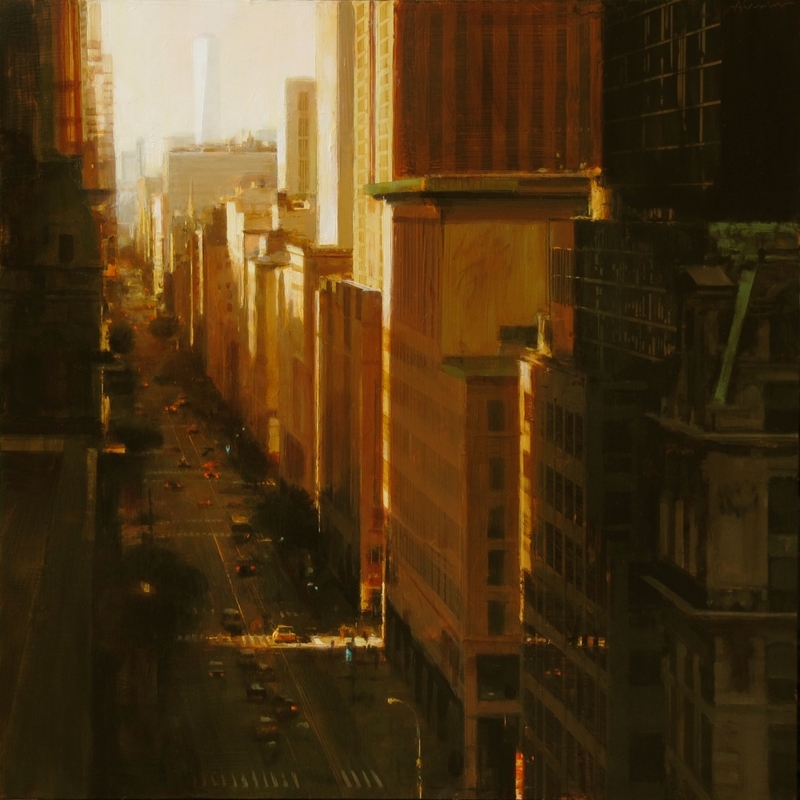 Aronson loves light and cityscapes, and “Summertime . . .” also features his new work of New York scenes, including Sunrise Over Fifth, whose luminous morning light is practically biblical. The sun bathes Fifth Avenue in sheets of brightness that, under Aronson’s brushstrokes, contrast with the patterns of squares and rectangles that form the tan and brown buildings projecting upward into the sky. The light recalls the kind of rhapsodic light that JMW Turner revolutionized two centuries ago, where Turner found a way to represent the sun’s mutable effect on everything in its path. Aronson counts Turner as one of his many, many influences. “He was,” Aronson says, “an important precursor to Abstract Expressionism, where the realistic image becomes less important.” And Aronson says the light he imposes on his own canvases is particularly relevant in his California paintings, whether it’s work he’s done in San Francisco or in Los Angeles, where he has also spent much time. While Aronson is an established painter with an art lineage that stretches back into the early 20th century, Maisel is a much younger artist. He’s in his mid-30s, five years out of his MFA from the California College of the Arts, and still tweaking his art practice. But Maisel hit a sweet spot with “As It Lays,” in which his sparse artworks — collaged abstractions of globular and other shapes, photographs, and angled surfaces — are like deceptively layered architecture. Each of the dozen or so pieces plays with space and spatial perception. Abstraction fits within abstraction. Overlapping materials and small additions — like the bottom, glistening surfaces that are angled like floorboards — evoke the feeling of a room. Or, rather, a room with blunted mirrors that hint at something factual but never quite reveal what those facts are. This alluring elusiveness is what Maisel has captured in a work like Sleeping Hands (3042), which contains a small photo of a hand but doesn’t advertise the hand’s history, backstory, or anything. The photo itself, of a mother holding a baby, is incomplete, a remnant within a sea of remnants. “As It Lays” is a mere five blocks from “Summertime …”, whose other noteworthy artworks include Julia Fullerton-Batten’s operatic photo Bathers at Tower Bridge and David Shrobe’s sculpture of combined objects (furniture, a frame, et cetera) called Portal. Like Maisel’s work, Shrobe’s piece is a kind of physical abstraction. What you see is not what you get. There’s much more there than what’s apparent at first. Seeing Portal just on a computer screen or a phone screen — which is how many people see art in the internet age — would do it a disservice. The same goes for Aronson’s work and the work of Maisel, who wrestles with the way people engage with art in the second decade of the 21st century. Maisel is navigating that line as best he can. “With the show, I’m emphasizing the difference between seeing the work online — which is a re-flattened representation of something I’m trying to add dimensionality to, and that is sculptural” Maisel says. “My work [in person] functions in a way that sculpture can, where your relationship to it in space changes as you move around it. It’s something that’s difficult to translate to a screen. Many, many more people see [my work] online than step foot into the gallery.